I mentioned that Carmageddon has begun earlier this month in this post. That is, combustion engine vehicles of all kinds (ships and boats, RVs and campers, trains and trucks and cars, tractors and semis, etc.) have begun spontaneously combusting all over the place as flammable gas plumes - hydrogen sulfide and methane - sweep through our atmosphere and increase in concentration. 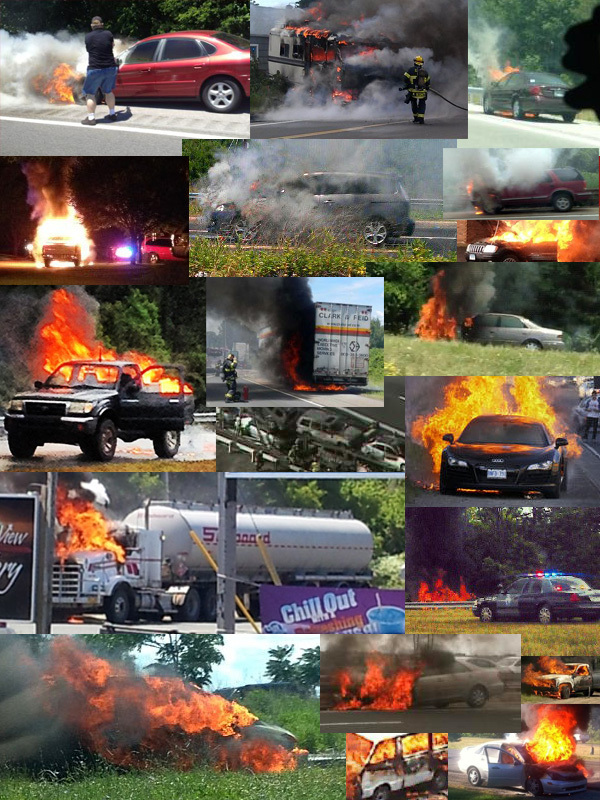 Vehicles are bursting into flame on streets and highways, in parking lots and carparks, inside garages and auto repair shops, in driveways and marinas and RV parks, everywhere. I've just found your site and it makes so much sense, explaining the weird events of today. I've noticed of late how many vehicles just burst into flames. This was a rare, rare occurrence in my lifetime, i'm 68. Thank-you for compiling all this, bringing it all together. Yeah, no doubt! Heck, my mom and I were in a car accident in 76, my mom wrapped one of the most fire-prone cars of all time, a Ford Pinto, around a telephone pole. No fire! Now it's like every third crash causes a fire, many of the crashes semi-minor but many of the fires serious. People used to make fun of Hollywood for unrealism with all the cars burning and/or exploding after crashing. Looks like Hollywood had it right - they were just early!